Liaison Officers from all eight New Zealand universities start visiting the College from February onwards to introduce students to their campus and courses. Some polytechnics and other private providers may also visit. 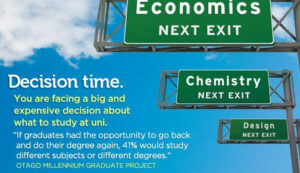 University Information Evenings and Open Days are another source of information. These visits are well advertised and students are encouraged to attend as many of the presentations as they can. By mid year students will have begun to firm up decisions on their University course and around that time University Prospectuses are available. They generally come to the College, but in some cases the University forwards them directly to students. These Prospectuses give invaluable information about degree structures, subject detail, Halls of Residence and other key information. From Term 3 the Liaison Officers from all the Universities return for Course Planning. Students should ensure they attend the Course Planning sessions at the College for their chosen University. Details of visit times can be found on the College Calendar. 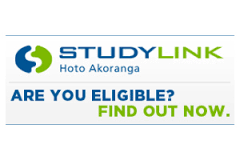 Final enrolment for university is on-line at each university’s website. Assistance is also offered in applying for your Student Loan and/or Allowance This process should be started well before the end of the year. Don’t forget if you are not sure what you are going to study or what your Major (what you are going to specialize in) should be, or even which University will be best for you go to No Major Drama which is a very helpful tool for planning your degree. Students intending to continue their study at any tertiary establishment (university, polytechnic or private provider) should ensure that they are aware of closing dates for their particular course. Anyone requiring assistance should go to the specific training provider website for closing dates or contact Mrs Browne. The New Zealand University Guide Group is pleased to announce the release of their new eBook New Zealand University Guide for International Students. They are making this 122-page book available as a free download from NZUGG and it is made up of committed individuals who have worked for many years in the tertiary education sector. The New Zealand University Guide is written with the school leaver in mind and adopts easy-to-understand language that connects with people of this age group. This will help Year 13 International students plan for next year.